Situated right in the heart of the West End, Shaftesbury Avenue, Yumi Izakaya is a ‘Japanese style gastropub’ serving authentic tapas-style small plates and skewers from their open robata grill. Located right bang in the middle of The Palace and The Queen’s theatre, the bar/restaurant offers theatre-goers an opportunity to enjoy unusual but delicious pre-and-post theatre dining (they have a two course theatre menu which is great value at £15), as well as being a perfect pit stop for those looking for good food and delicious cocktails. We kicked off our visit with some delicious cocktails: the sweet (but strong) Pineapple Martini and the Armand Cheri which was absolutely delicious: a mixture of Ameretto, Cherry Liquer and Soda. These were accompanied by some piping-hot, soy soaked Edamame beans. Our amazing waiter Remi guided us expertly through the menu, displaying his clear passion for the food and the ingredients involved. We kicked off with some YUMI fries: crisp fries topped with sweet Okonomiyaka sauce, creamy mayonnaise and a generous amount of Bonito flakes (tracing paper thin dried tuna) and edible seaweed. This was delicious: a mixture of ordinary crispy fries with very unusual and umami-filled flavours and textures. My companion, who never usually eats fries, scoffed the lot! The fish flakes, though rather perturbing to look at as they shivered in the passing breeze were quite literally ‘yumi’! The Braised Aubergine was another umami (translated as “pleasant savoury taste”) rich dish, with the aubergine having been braised in Sake, Mirin and Soy before being cooked on the grill – they looked unctious, moist and inviting sprinkled with fresh spring onion and finely diced red chilli. We also enjoyed some Pork and Ginger Gyoza: the thin casing perfectly poached and fried to delightful crispness on one side. Remi advised that we should pierce each gyoza several times with a fork before pouring a little dipping sauce on in order to infuse each parcel with it’s tangy, salty flavour: this worked a treat. The chicken thigh skewers were delicate in portion but exquisitely cooked: the thigh meat maintaining its juicy tenderness and with a slightly charred taste from the grill – this contrasted perfectly with the sweet tare marinade which coated each morsel. We also ordered the Okonomiyaki Osaka Style pancake was good, soft and unctuous but a little similar in flavour to the Yumi Fries: I would recommend diners don’t order both. For my companion, the highlight was the ‘Bao of the Day’ a fluffy, Japanese style bap, stuffed with slow braised beef cooked in Soy, Saki and Mirrin, Asian Slaw, Nashi Pear, White Cabbage and crispy Shallots. This was soft, crunchy, rich, sweet and savoury all at once! Delicious! We finished the meal with some ice cream pops – cute balls of ice cream on a stick, which were the perfect light, sweet end to a quite indulgent meal. As you might expect, Yumi Izakaya stocks an excellent range of Sake (Japanese rice wine). I’m a bit of a Sake novice, but I really enjoyed the Blood Orange flavoured Sake which we sampled. 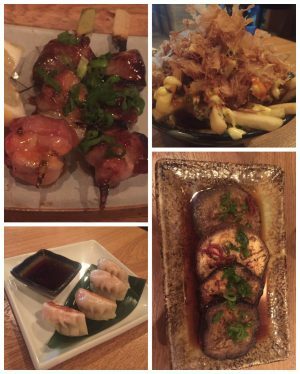 If you’re in Soho or on your way to the theatre nearby, I would heartily recommend Yumi Izakaya: it’s a world away from the same-old chain outlets nearby with their identical offerings. Head to Yumi Izakaya for deliciously different food and cocktails in a great location and friendly, attentive service.